A VERY SCARCE AMERICAN REVOLUTIONARY PERIOD SOLDIER’S LEATHER “CHARLEVILLE” CARTRIDGE BOX w/ BELT, (partial) BAYONET SCABBARD & BAYONET, ca. 177O: In overall very good+ condition with dark, supple, slightly crazed, black leather surfaces with scattered signs of expected use/wear. 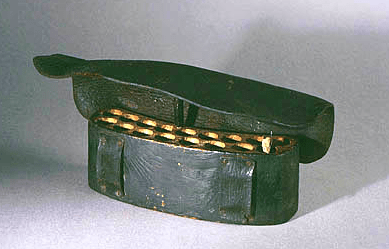 The box of typical American design; and of leather and wood construction with a wooden (pine?) 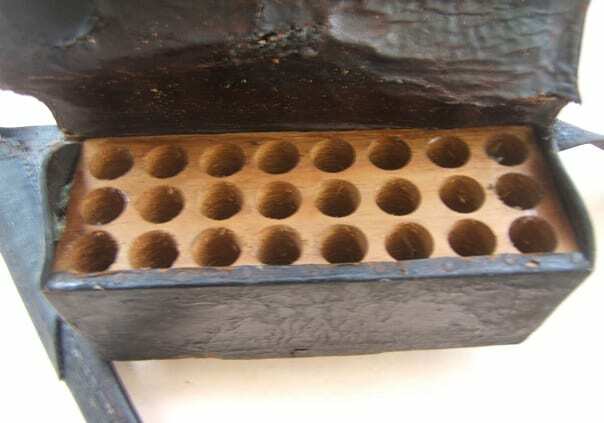 cartridge block having twenty-four (Nine x Eight x Seven), .74 caliber, “Charleville” cartridge-holes. 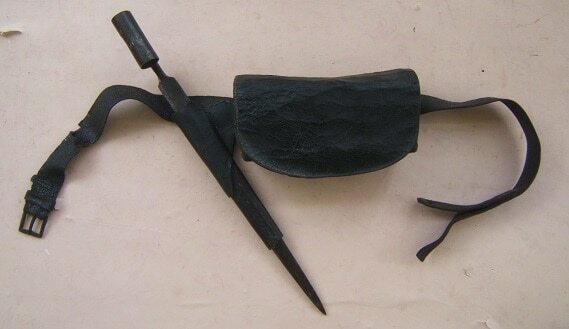 Dark, black-brown, leather-covered body with its original hand-sewn rain flap and its brass- “trade”-type, securing-tacks. Very good rain-cover with its leather securing-loop and the base of the block with a hole for the missing catch. Retains its original back-mounted loops and its matching leather suspension-belt with its hand-forged iron buckle. The belt, en suite with generally supple, very good, crazed leather surfaces, its securing-loops and some expected minor tears/abrasions. Complete with its original scabbard (partial) for its American-made “Charleville” Bayonet. 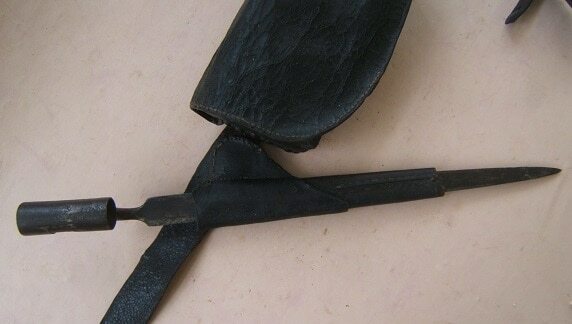 The bayonet with a tapered, blacksmith made, nicely forged, flat, triangular, 14 5/8″ x 1”, unmarked blade of classic Rev. War Period form. 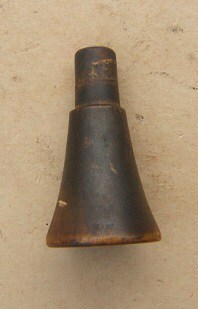 The socket (for a top-lug-mounted bayonet-lug) with an open “Z” shaped lug-slot. In overall very good+ untouched condition with generally sharp contours and a fine point; and a classic example of an American Blacksmith made Revolutionary War Period American “Charleville”/”COS” Musket Bayonet, ca. 1770s. Overall length (Bayonet), 18″. In very good+ complete condition: the leather with professionally preserved, supple surfaces, minor tears and some scattered abrasions/crazing. Fine (pine?) cartridge block with sharp contours, some light wear/age-stains and untouched oxidized surfaces. The hemp-fiber stitching with generally tight seams; and the belt and Buckle with untouched surfaces. A Classic and Scarce example of an Original Revolutionary War Period American Soldier’s Cartridge Box, Belt, Scabbard & Bayonet, ca. 1770. For similar examples, Please see: G. C. Neumann’s & F. Kravic’s: “The Collector’s Illustrated Encyclopedia…”, pg. 68-80. Box Measures, approx. 8 1/2″ x 4″ x 3″. 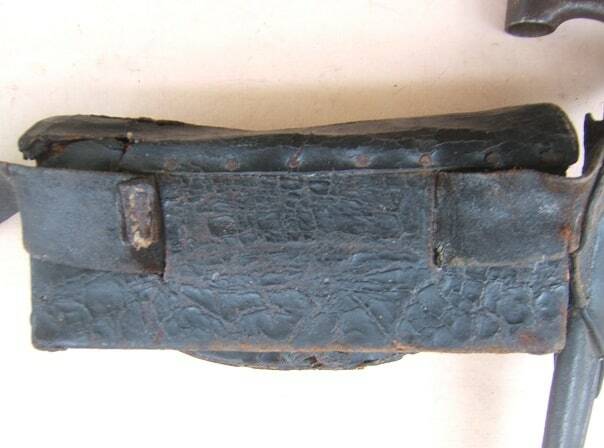 Overall length of Belt, 40“.